Three American Vietnamese ladies look forward to dessert. Saigon’s Central Market - Great for a look, shopping and a surprisingly good spot for tasty Vietnamese soup be it pho, bun bo or hu tieu. 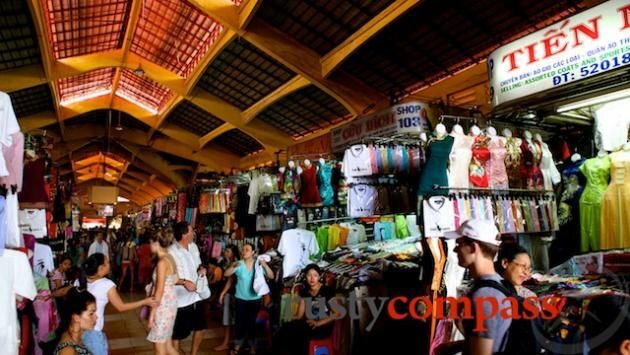 Ben Thanh Market is Saigon's central market so you can probably guess what a bursting and bustling space it is. 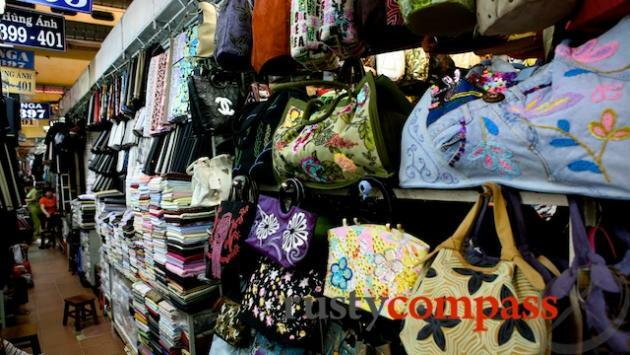 It's a great place to stock up on souvenirs, T shirts, bags, coffee and other local products that sell at higher prices in the city's more upmarket shops. But even if you're not on a shopping mission, Ben Thanh Market is a must see. It's a great place to start an education in local cuisine - very local. It's all there for you to see and sample for next to nothing. 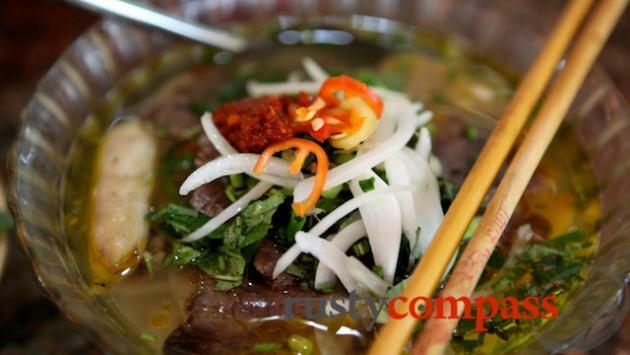 Pho, Bun - the full collection of tasty southern Vietnamese soups are on sale and much more. 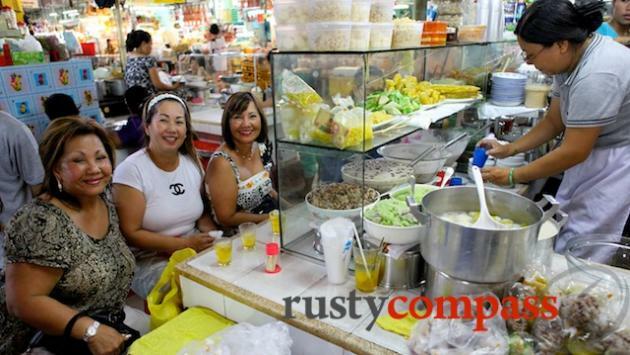 You could easily return to the market's food court more than once for good quality inexpensive local cuisine. By night, the street food just outside the market is also very tasty and excellent value. Nor far from the food stands is the wet market. The Vietnamese have an impressive capacity to conjure culinary wonders from most of the organs of most of the creatures in the local animal kingdom. The nearby fruit markets also feature some outstanding tropical exotica from the Mekong Delta not to be passed over during a visit to Saigon. Ben Thanh Market has been the focus of the city's commercial life since it was completed under French rule nearly a century ago. It has outgrown the main structure and now spills over into the adjacent streets. Saigonese have been so enamoured of their central market that some of the thousands who fled communism to Melbourne Australia in the 1970s and 80s built a replica in Richmond not far from downtown, to remind them of better days in a homeland from which they were at that time estranged. 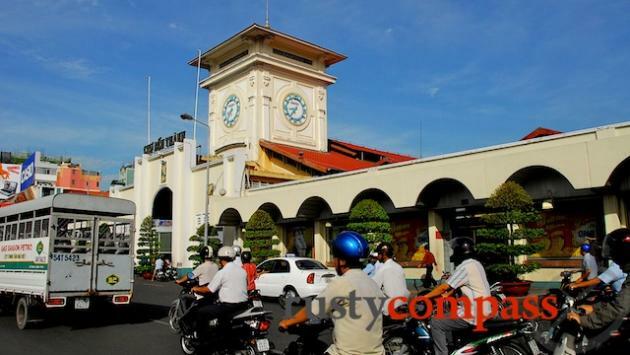 What is about details of Ho Chi Minh weather for travelling? I just find a little bit of it from http://saigon-online.net/index.php/ho-chi-minh-city-weather-travelling-experience/ Please suggest more!